Bay Area artist Lisa Solomon considers her art practice a form of research through which to pose questions relating to her identity as a Japanese-Jewish-Caucasian woman. Her impetus for this exhibition was to investigate the impact on Japanese Americans of the 1942 Executive Order that forced them into internment camps. As is her custom, Solomon employs a range of mediums, including sculpture, collage, drawing and installation, as well as craft techniques such as origami and stitching. In several mixed media works, we learn that interned Japanese Americans took a stoic attitude towards their encampment, in that they embraced their dual identities and maintained a strong sense of community by celebrating both Japanese and American holidays and festivals. In “Christmas Time at Jerome,” a group of women is depicted in black and white, except for their red Christmas hats with real dangling red threads. Some smile as they pose before a background of dormitories made of colorful red-and-white floral patterns that are reminiscent of decorative motifs found on Japanese kites or kimonos. Another body of work focuses on the heartbreak that most undoubtedly suffered in having to leave behind their livelihoods. 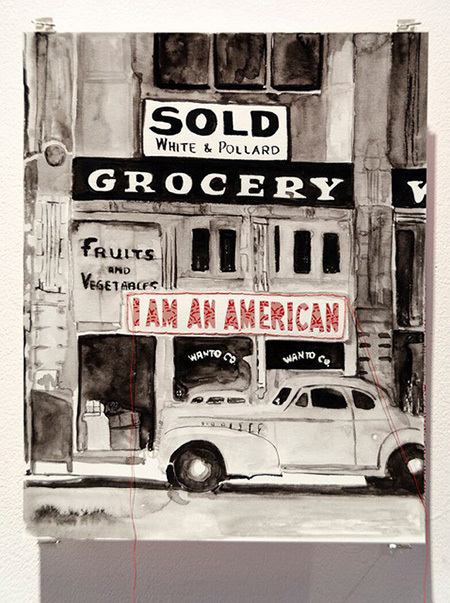 In a striking series of watercolors with cut-outs overlaid on hand screen printed patterned paper, Solomon paints red-on-white signage with phrases such as “I AM AN AMERICAN” and “EVACUATION SALE” in otherwise black-and-white compositions. Historically evocative they may be, but they are easily envisioned in front of homes now occupied by Muslim Americans or Dreamers. The most powerful works are the most minimal. Two miniature-scale sculptures poignantly echo Holocaust survivor Elie Wiesel’s imperative in reference to the German concentration camps of the same era: “we must never be silent” and “we must never forget.” “Ojuzu-108” and “Chawan with Chataku, 25 camps/25 tea bowls” employ ceremonial arrangements of tiny gilded terracotta pagodas and gold-inscribed paper clay teacups to represent the camps and their communities. One can easily envision either work on a larger scale, permanently installed near one of the former camp sites.